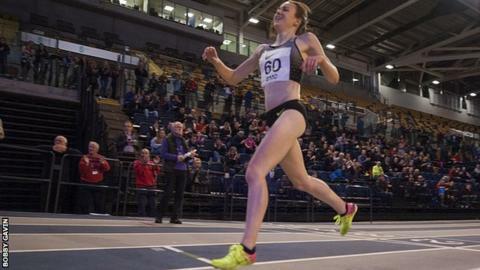 Laura Muir broke the British indoor record over 5,000m at the Glasgow Miler Meet at the Emirates Arena. Muir's time of 14 minutes 49.12 seconds beat fellow Scot Liz McColgan's 25-year-old record by 14 seconds. "I am delighted to get it and it is nice to know now where I am at in terms of the 5,000m," said Muir, 23. "I've been in South Africa training, and the sessions there since we came back were at PB times for 5,000m so I felt good going into tonight's race." Speaking to BBC Radio Scotland on Thursday, McColgan described Muir as "world class", but questioned if her feat satisfied all the criteria to make the record stand. British Athletics has since confirmed that Muir's time is official. Muir broke her own British 1500m record at the Diamond League meeting in Paris in August and reached the 1500m Olympic final at Rio 2016. The Scot will next captain the Great Britain team competing at Saturday's Great Edinburgh International Cross Country, which will be shown live on BBC One from 13:15 GMT. Muir lines up as part of the mixed 4x1km relay team, while Sir Mo Farah competes in the men's 8km race and Gemma Steel and Steph Twell in the women's event over 6km.